The Tupperware citrus peeler is a silly looking gadget that is one of the key tools in my kitchen. Years ago I heard people rave about them but never knew where to find them. I didn’t know anyone who sold Tupperware and these things weren’t sold in the stores. They were often given away at Tupperware parties but weren’t something that a person could necessarily purchase. One year, while at the trade show of Klondike Days (Edmonton’s old name for Capital Ex, the annual summer fair), there was a Tupperware stall. I asked the lady about the peeler and to my excitement she agreed to sell me some. I ended up buying five of them; three went to family members and I hoarded two for myself. The little hook part is dragged along the skin to cut it open. The opposite flat end is amazingly efficient at poking into crevices and shaving off pith. Nowadays, you can buy these things off of eBay and other online places so there is no need for searching anymore. But my little blue peelers are still going strong so I think it will be a while before I need new ones. Oh the memories. I think I’ve inherited my mothers from the 80’s which is a good thing because until you mentioned their availability from Tupperware, I never knew where I would get another. My mom always had those things! Probably still does. If you had not told me, I wouldn’t have had a clue about how it was used. That is a very kind offer, thanks! Are you located in Edmonton? I am a UK Tupperware consultant, and people often ask for the citrus peeler. I can certainly get hold of them if anyone here needs one. 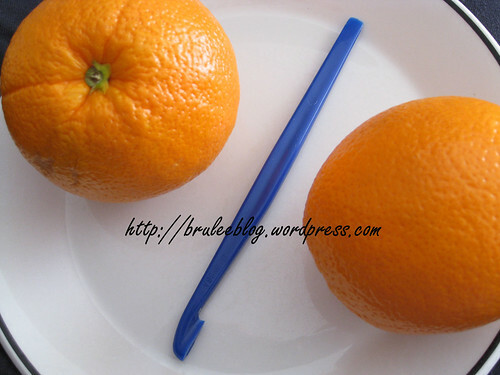 I had a Tupperware orange peeler for about 40 years and it was invaluable. I think it was a free gift from Tupperware for winning a game.Recently it must have got thrown out with the orange peel (it was yellow) and I’ve looked everywhere to buy one. I live in Australia but could give you my daughters UK address. Please advise how much this would cost. Thank you. Gillian, they are very cheap, £1 or so, plus postage. Click on my name to email me via my website.